The Cranbrook Educational Community is an education, research, and public museum complex in the state of Michigan. This National Historic Landmark was founded in the early 20th century by newspaper mogul George Gough Booth. Cranbrook's campus is located within the Detroit suburb of Bloomfield Hills. It consists of Cranbrook Schools, Cranbrook Academy of Art, Cranbrook Art Museum, Cranbrook Institute of Science and Cranbrook House and Gardens. The founders also built Christ Church Cranbrook as a focal point in order to serve the educational complex. However, the church is a separate entity under the Episcopal Diocese of Michigan. The sprawling 319 acre (129 hectare) campus began as a 174-acre (70 ha) farm, purchased in 1904. The organization takes its name from Cranbrook, England, the birthplace of the founder's father. Cranbrook is renowned for its architecture in the Arts and Crafts and Art Deco styles. The chief architect was Eliel Saarinen while Albert Kahn was responsible for the Booth mansion. Sculptors Carl Milles and Marshall Fredericks also spent many years in residence at Cranbrook. Cranbrook Schools today comprise a co-educational day and boarding college preparatory "upper" school; a middle school; and Brookside Lower School. The first school to open on the Cranbrook grounds was the Bloomfield Hills School in 1922. Founded by George Booth, the Bloomfield Hills School was intended as the community school for local area children (of which there were then very few). The Bloomfield Hills School ultimately evolved into Brookside School. Following completion of the Bloomfield Hills School, Booth looked forward to building the Cranbrook School for Boys, an all-boys College-Preparatory school at which students from the Detroit area and abroad would come to reside. Booth wanted the Cranbrook School to possess an architecture reminiscent of the finest British Boarding Schools, and hired Finnish architect Eliel Saarinen to design the campus. Cranbrook's initial phase of building was completed in 1928. Over the years, the Cranbrook School for Boys campus grew to include Stevens Hall, Page Hall, and Coulter Hall. While primarily functioning as only residential spaces, Page Hall featured a smoking lounge as well as a shooting range. Lerchen Gymnasium, Keppel Gymnasium, and Thompson oval were also constructed on the campus. In the 1960s, Cranbrook School for Boys also constructed a state-of-the-art Science Building named the Gordon Science Center. Realizing that young women would also need a place of their own to learn Ellen Scripps Booth, Booth's wife, pressured Booth into building a school for girls. Scripps Booth supervised the project, which she named the Kingswood School Cranbrook. Unlike her husband, Ellen encouraged Saarinen to come up with a unique interior design for the campus that was completely on his own. Instead of the several buildings that housed the Cranbrook School for Boys, the Kingswood School Cranbrook was contained within one building which included all necessary features. It housed dormitories, a dining hall, auditorium, classrooms, bowling alley, lounge/common areas, and a ballroom. The education at Kingswood School Cranbrook was primarily viewed initially as a "finishing school" although that would change over time. In 1986, the Cranbrook School for Boys and Kingswood School Cranbrook entered a joint agreement renaming the new institution the Cranbrook Kingswood Upper School. The Cranbrook Academy of Art, one of the nation's leading graduate schools for architecture, art, and design, was founded by the Booths in 1932. By 1984, The New York Times would say that "the effect of Cranbrook and its graduates and faculty on the physical environment of this country has been profound ... Cranbrook, surely more than any other institution, has a right to think of itself as synonymous with contemporary American design." The buildings were designed and the school first headed by Eliel Saarinen, who integrated design practices and theories from the arts and crafts movement through the international style. The school continues to be known for its apprenticeship method of teaching, in which a small group of students, usually only 10 to 16 per class (150 students in total for the ten departments), study under a single artist-in-residence for the duration of their curriculum. The graduate program is unusual because there are no "courses" - all learning is self-directed under the guidance and supervision of the respective artist-in-residence. Beginning in 1983, a major exhibition of works by Cranbrook's faculty and graduates, entitled "Design in America: The Cranbrook Vision 1925–1950", toured major museums in the United States and Europe. The Detroit Institute of Arts and Metropolitan Museum of Art co-authored a book detailing the works in the exhibit. Master of Architecture (Post-professional degree). Note: the Master of Architecture degree is not accredited by the National Architectural Accrediting Board. Notable alumni and faculty of the Art Academy include Harry Bertoia, Richard DeVore, Charles Eames, Ray Eames, Waylande Gregory, Florence Knoll (did not graduate), Daniel Libeskind and Eero Saarinen. In 1932, sculptor Marshall Fredericks was invited by Milles to join the staffs of the academy and schools, teaching there until he enlisted in the armed forces in 1942. In 1987, Keith Haring served as artist-in-residence. 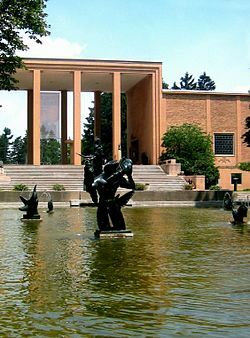 Cranbrook Art Museum is a museum of contemporary art with a permanent collection including works by Charles and Ray Eames, Harry Bertoia, Maija Grotell and Carl Milles, as well as Robert Motherwell, Andy Warhol and Roy Lichtenstein. Completed in 1942 under the direction of architect Eliel Saarinen, the museum is housed in the same building as the Cranbrook Academy of Art. The Museum closed in 2009 for a two-year renovation and expansion with the addition of a Collections and Research Wing. The museum also offers tours of Saarinen House, which has undergone painstaking restoration beginning in 1977. The remaining areas of the house were completed between 1988 and 1994. The museum is accredited by the American Alliance of Museums. Sculptor Carl Milles' numerous works in Metro Detroit include those at Cranbrook Educational Community such as Mermaids & Tritons Fountain (1930), Sven Hedin on a Camel (1932), Jonah and the Whale Fountain (1932), Orpheus Fountain (1936), and the Spirit of Transportation (1952), currently in Cobo Center. The newly expanded museum opened in November 2011 after two years of construction. The project restored aspects of the original building designed by Saarinen, made needed structural repairs, replaced windows, and upgraded mechanical systems. The museum features year-round, changing exhibitions as well as a new Collections and Education Wing, an additional 20,000 sq ft (1,900 m2) of storage and classroom space open to visitors by guided tour. Based on an open storage plan, the new wing allows the museum's entire collection to be seen. The Cranbrook Institute of Science includes a permanent collection of scientific artifacts, as well as displays of annual temporary exhibits. It also features a planetarium and a powerful telescope through which visitors may peer on selected nights. The museum grounds feature a life-sized statue of a Stegosaurus. From 1946 to 1970, the institute awarded the Mary Soper Pope Medal for notable achievement in plant sciences. Cranbrook House and Gardens are the centerpiece of the Cranbrook Educational Community campus. The 1908 English Arts and Crafts-style house was designed by Albert Kahn for Cranbrook founders George Gough Booth and Ellen Scripps Booth. Ten first-floor rooms can be seen on guided tours, and contain tapestries, hand-carved woodworking, and English Arts and Crafts-style antiques. The upper floors of the house are used for the executive offices of the Cranbrook Educational Community. The 40-acre (160,000 m2) gardens were originally designed by George Gough Booth, and include a sunken garden, formal gardens, bog garden, herb garden, wildflower garden, Oriental garden, sculpture, fountains, specimen trees, and a lake. Leonard Bernstein recalled composing portions of his Symphony No. 2, The Age of Anxiety, on the Cranbrook House Steinway concert grand piano while residing there in April 1946. Bernstein had come to Detroit at the request of Zoltan Sepeshy to conduct the Detroit Symphony Orchestra at Music Hall. While visiting, he requested studio space where he could compose and Sepeshy had the piano moved from Cranbrook House into St. Dunstan's Playhouse. The house and gardens are open to the public from May through October. St. Dunstan's Playhouse, while not formally a part of the Cranbrook Educational Community, is located on the Cranbrook grounds near the Cranbrook House. The Playhouse, a 206-seat theater, houses the St. Dunstan's Theatre Guild of Cranbrook. The guild was founded in 1932 by Henry Scripps Booth, son of Cranbrook's founders George and Ellen Booth. In the summer months, the St. Dunstan's Theatre Guild performs in the outdoor Greek Theatre adjacent to the Cranbrook House. The theatre was restored in 1990-91. Fourteen buildings making up the Cranbrook complex were added to the National Register of Historic Places in 1973, and were further designated a National Historic Landmark in 1989, cited as being "one of the most important groups of educational and architectural structures in America". Wikimedia Commons has media related to Christ Church Cranbrook. ^ a b "Cranbrook". National Historic Landmark summary listing. National Park Service. Archived from the original on 2014-07-26. Retrieved 2008-06-27. ^ Coir, Mark (2005). "Cranbrook: A brief history" (PDF). Cranbrook Community. Retrieved 2019-03-22. ^ Newton-Matza, Mitchell (6 September 2016). Historic Sites and Landmarks that Shaped America: From Acoma Pueblo to Ground Zero [2 volumes]: From Acoma Pueblo to Ground Zero. ABC-CLIO. p. 128. ISBN 978-1-61069-750-7. ^ a b Goldberger, Paul (8 April 1984). "The Cranbrook Vision". The New York Times Magazine. Retrieved 2009-10-10. ^ Palacio, Bryony Gomez; Vit, Armin (December 1, 2011). Graphic Design, Referenced: A Visual Guide to the Language, Applications, and History of Graphic Design. Rockport Publishers. p. 130. ISBN 978-1-59253-742-6. ^ Clark, Robert J; Andrea P. A. Belloli (March 1984). Design in America: The Cranbrook Vision, 1925–1950. New York: Harry N Abrams. ISBN 978-0-8109-0801-7. ^ "Keith Haring - Biography". Renoir Fine Art Inc. Retrieved 2013-08-01. ^ "Cranbrook Art Museum". Cranbrook Community. Archived from the original on 2011-02-24. Retrieved 2011-04-07. ^ Wittkopp, Gregory; Balmori, Diana (March 1995). Saarinen House and Garden: A Total Work of Art. Harry Abrams. pp. 8–9. ISBN 978-0-8109-4462-6. Retrieved 2019-03-22. ^ a b "Building Chronology 1976-2000". Cranbrook Community. Archived from the original on 2012-04-14. Retrieved 2011-11-09. ^ Baluch, Vivian M. (6 September 1999). "Michigan History: Carl Milles, Cranbrook's favorite sculptor". The Detroit News. Retrieved 2007-11-23. ^ "At the Birthplace of Modernism, A Rebirth" (Press release). Cranbrook Community. 27 July 2011. Archived from the original on 28 November 2011. Retrieved 2011-11-10. ^ "Cranbrook Institute of Science Director's Papers". Cranbrook Community. Retrieved Dec. 27, 2016. ^ Your Gateway to Cranbrook, Cranbook Community. Accessed March 22, 2019. ^ Presenter: Richard Guy Wilson (1997). "Newspaper Moguls, Pittock Mansion, Cranbrook House & Gardens, The American Swedish Institute". America's Castles. A&E. ^ Luzenski, James (July 2006). "St. Dunstan's Guild Records (Summary)" (PDF). Cranbrook Archives. p. 4. Retrieved 2013-08-01. ^ a b Pitts, Carolyn (February 9, 1989). "National Register of Historic Places Registration Form: Cranbrook". National Park Service. Retrieved January 24, 2016. Accompanying nine photos from 1959 and 1980. Bloomfield Hills High School is in Bloomfield Township but it also serves Bloomfield Hills. This page was last edited on 3 April 2019, at 04:03 (UTC).